The coming of Christ for His Body is quite a different event, and belongs to quite a different Dispensation, than the coming of Christ to the earth with great power and to execute judgment. The end for which the Body of Christ is waiting is not judgment or tribulation, but to be "received up in glory" (1 Timothy 3:16), to be "called on high" (Philippians 3:14). The Body of Christ's seat of government exists now in heaven, from whence we look for the Savior (Philippians 3:19-21). That coming is into the AIR, and NOT unto the earth; it is in Grace, and NOT in judgment; and it concerns those who are "IN Christ". Nothing is revealed in the Old Testament or in the Gospels about this coming! Those books know nothing of it. This coming concerns the Mystery, which was kept secret from times eternal, and was "hid in God", until revealed by the Holy Spirit through the Apostle Paul. The Body of Christ (which is the Mystery) waits for ONE thing, and that is to be "received up into Glory" (1 Timothy 3:16). But this is NOT the subject of the Book of Revelation. To make this even clearer we must compare what we call the "second" Advent with the "first" Advent. When the Coming of the LORD was announced in Micah 5:2, it was announced as a coming FORTH; and then in Zechariah 9:9 as a coming UNTO. Micah speaks of the coming forth at Bethlehem, and Zechariah of the coming unto Jerusalem. Now, pay attention here, there was nothing in those prophecies to tell the Jewish reader whether there would be any interval between these events, or what that interval would be. The Jewish Bible student might think there was a discrepancy; while the Jew with the mind of a "higher critic" might see a greater difficulty, and refuse to believe either Scripture. Now, of course today, we, with our knowledge, know that there was an interval of more than THIRTY years between the two events. Both refer to one and the same Coming, but to two different stages in it; and that all the events between them go to make up what we speak of as the "first Coming." We believe that it will be exactly the same with regard to what we call the "second Coming." 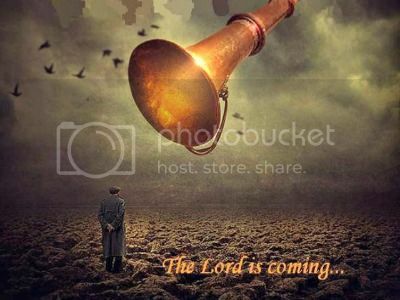 There will be the same two stages, with a similar INTERVAL (or longer it may be) between them, and all the events (which are recorded in the Book of Revelation and elsewhere) will go to make up what we speak of as "the second Coming." This will also provide opportunity for the Antichrist to set up his kingdom, albeit for "an hour". There will be the coming forth (as at Bethlehem) of "the LORD Himself" and the calling of His saints on high (Philippians 3:14), and the receiving of them in glory (1 Tim. 3:16); and then, LATER ON, to fulfill all the prophecies which related to His People Israel; and, as the Son of man will "come unto" the earth, to take unto Himself His great power, and reign. This LATTER COMING is connected with "the Day of the LORD," and it is THAT which the subject of the Book of Revelation is. Revelation 1:7 settles this for us, "Behold, He cometh with clouds; and every eye shall see him, and they also which pierced him: and all kindreds of the earth( a better rendering would be "the Land") shall wail because of him." Only Jew and Gentile are in this verse, and not the Body of Christ. This is the Coming of which Israel's Prophets speak. See Daniel 7:13 and Zechariah 12:9-10, which is the Scripture referred to here. This is the Coming which the LORD spoke of when on earth in Matthew 24:30-31; Matthew 26:64, and elsewhere (make note of the "ye"). What He there said is perfectly clear, and in perfect harmony with all that had been said in the Old Testament. Therefore, to read Ephesians, Philippians, and Colossians into the Gospels is only to create confusion; and make a difficulty where none before existed: it uses one truth for the upsetting of another. The same difficulty is created when we arbitrarily introduce these later Prison Epistles of Paul into the Book of Revelation. And, to save us from making such a mistake, the Holy Spirit gave special instruction, through the Apostle Paul in 1 Thessalonians 5, immediately after He had inspired the revelation of 1 Thessalonians 4. If we pay attention to this and learn the great and important lesson here, all will be perfectly clear. 1 Thessalonians 5: 1, "But of the times and the season, brethren, ye have no need that I write unto you." Why, "no need"? Simply because the Coming forth into the air and our "gathering together unto Him" there, do not depend on any time or season. His "Coming unto" the earth DOES; but that is NOT what he had been speaking about in the chapter immediately before (Thessalonians 4). 2. "For yourselves know perfectly that the Day of the LORD so cometh as a thief in the night." It is the "Day of the LORD" which (as we have been discussing above) is the subject of the Book of Revelation: and in Revelation 3:3, the LORD distinctly warns as to His Coming "as a thief," which is the VERY OPPOSITE of what we read of in Ephesians, Philippians, and Colossians, and even in 1 Thessalonians 4-5. For mark the sudden change of pronouns in the latter chapters. 3. "For when THEY shall say, 'Peace and safety,' then sudden destruction cometh upon THEM, and THEY shall not escape." It is this "destruction" which the Book of Revelation describes. It is this which gives its character to "the Day of the LORD." It is "sudden," and comes "as a thief;" and it comes upon "THEM" and "THEY," not upon us: for mark the change of pronouns again. 4. "But YE, brethren, are not in darkness, that that Day should overtake YOU as a thief." Here, our point is spot on and emphatically stated, with a pin-pointing which leaves nothing to be added. Can anything be clearer than the fact that the Church of God of the Dispensation of Grace, the Church of the Mystery, the Body of Christ, is NOT the subject of the Book of Revelation...And that the "Coming" which IS the subject of the Book of Revelation is NOT the Coming for which the Body of Christ is now longing, waiting, and looking? The Book of Revelation is "prophecy," and therefore it awaits a future fulfillment in "the Day of the LORD," when the LORD Jesus shall be unveiled as the Son of man, and every eye shall see Him. In Matthew 21:42 Christ told Israel that He was to be the rejected Stone in fulfillment of the Scriptures. “It was the LORD’s doing,” (Matthew 21:42; Acts 4:25-29; Acts 2:22; Acts 3:18). In Acts 3:19-21 we learn that Christ is coming back to EARTH for the restitution of all things, in fulfillment of the Scriptures. Samuel, and all of the prophets spoke of “these days.” (Acts 3:24). Christ “came unto His own and His own” re­ceived Him not. (John 1:11). At the time Christ was dying, He prayed for Israel in Luke 23:34, “Father, forgive them, for they KNOW NOT what they do.” How did that prayer change God’s attitude toward Israel? Well, take note of the LORD’s message of mercy and forgiveness after He accused Israel of “killing the Prince of Life.” (Acts 3:14-15). “‘And now, brethren, I wot that through ignorance ye did it, as did also your rulers. But those things, which God before had showed by the mouth of all His prophets, that Christ should suffer, He hath fulfilled.” (Act 3:17-18). AND THEN...The “therefore” and the RESTITUTION message of Acts 3:19-21. Christ was delivered according to God’s determinate counsel and foreknowledge. He HAD to die WHEN He died and AS He died. (1 Peter 1:18-20;Matthew 26:24). There­fore, on the ground of the “KNOW NOT,” in Christ’s prayer, and the “IGNORANCE” of Acts 3:17, if Israel’s rulers, with Israel, would repent they would receive all the kingdom bles­sings of Joel Two, of which Acts was but a sample (Acts 2:16-20). Call this a second Kingdom chance, or what you will, but there was a new PROPOSITION from God to Israel. But this differed greatly from God’s new Dispensation of Grace given to and presented by the Apostle Paul. (Ephesians 3:1-4; Romans 11:30; Romans 11:11). Israel was told, REPENT! and God will send Christ back to earth for the prophesied kingdom RESTITUTION. Christ will return to build again the tabernacle of David. (Acts 15:15-18). 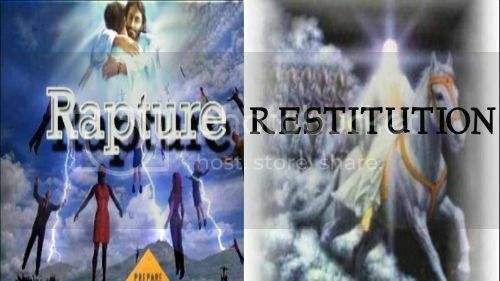 Israel did NOT repent and the RESTITUTION was postponed. The Kingdom was not restored to Israel. (Acts 1:6). Therefore, God introduced a NEW program by a NEW apostle, concerning the NEW creation and the One NEW Man. (2 Corin­thians 5:16-17; Ephesians 2:15). Christ was no longer known after the flesh. These new creatures could then say with the Apostle of the Gentiles, “For our citizenship is in heaven; from whence also we look for the Savior, the LORD Jesus Christ: Who shall change our vile body, that it may be fashioned like unto His glorious body, according to the working whereby He is able even to subdue all things unto Himself.” (Philippians 3:20-21). When Christ appears to do this, it will not be for the RESTITUTION of Acts 3:21. There is a great difference between Christ coming down here and our being raised up in the Heavenlies. These new creatures will all be present when the RAPTURE of 1 Thessalonians 4:13-18 takes place. The Blessed Hope of Titus 2:13 will be realized when Christ comes for His Body. Now, between the RAPTURE and the RESTITUTION there will come trouble on the earth. Read Luke 21:24-33. It is the time of Ja­cob’s trouble...and Jacob shall be saved. (Jere­miah 30:7-11). The Body of Christ will be with it’s Head, the LORD Jesus Christ, in glory be­fore Christ’s return for the prophesied RESTITUTION. Christ was in the world and the world was made by Him, and the world knew Him not. This is the testimony of the Holy Spirit in John 1:10. And, because the rulers, spiritual and physical, of this world knew not the eternal purpose of God in Christ, they crucified the LORD of Glory. 1 Corinthians 2:8. “They killed the Prince of Life.” Acts 3:14-15. To the religions self righteous Jews on earth, when Christ was in their midst...their Messiah said, “do not think that I will accuse you to the Father: there is one that accuseth you, Moses, in whom ye trust: For had Ye believed Moses, ye would have believed Me, for he wrote of Me. But if ye believe not his writings how shall ye believe My words?” John 5:45-47. The Jews would not believe their own Scriptures. They claimed to believe Moses, but they did not. Just as the Modernists claim to believe Christ; but they do not. The Jews saw Christ feed five thousand people with one scanty meal; they saw Him calm the stormy sea; they saw Him raise Lazarus from the dead; they acknowledged that He was a Teacher come from God; that He spoke as never men spake; that He might be John the Baptist raised front the dead or some old testament prophet reincarnated; but when Christ made Himself equal with God, they took up stones to kill Him John 10:28-35. Then Christ added, “they hated Me without a cause." What a wonderful truth this is! AND, this still seemeth good unto the Father. When Simon made the great confession to the Messiah “Thou art the Christ, the Son of the living, God,” The Son of God said a most significant thing, “BLESSED ART THOU...FLESH AND BLOOD HATH NOT REVEALED THIS UNTO THEE. BUT MY FATHER WHICH IS IN HEAVEN.” Matthew 16:16-19. In line with this great truth, the Apostle Paul wrote years later, “no man can say that Jesus is LORD except by the Holy Spirit.” 1 Corinthians 12:3. In Ephesians 1:16-19, we learn that the same God and Father of our Lord Jesus Christ gives the Spirit of wisdom and revelation to all members of the Body of Christ who really desire to know the deep things of God. “For the Spirit searcheth all things, yea the deep things of God.” 1 Corinthians 2:10. But LOOK, millions of members of the Body of Christ, who believe the report concerning the virgin birth and eternal Deity of the LORD Jesus Christ, do NOT believe the LORD’s report concerning “the Mystery of Christ” in Ephesians 3:1-11. Why? One reason is because the eyes of their understanding have not been enlightened in accordance with Ephesians 1:18. 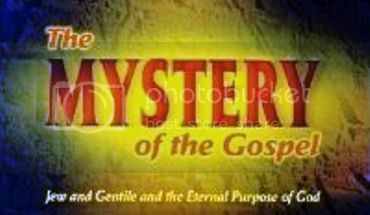 This Mystery is, to the great majority of redeemed saints, “The Mysterious Mystery.” Its enemies in the assemblies are many, and even some fundamentalists call it divisive teaching, because they have not received the Spirit of revelation. Like the Jews in the days of Christ, they have agreed that they will put out of the synagogue any who confess and teach that the risen LORD revealed a Mystery to the Apostle Paul different from the message and program which He gave to the twelve Apostles. This, right here, is THE cause of all of the schisms and divisions in the Body of Christ today, because the eyes of their understanding have not been enlightened in accordance with Ephesians 1:18. As I said, the answer to all of these questions should be a confident "YES!" Now, the answer to all of the following questions should be a confident "NO!" Again, these should all be answered with a NO. Now, the Bible has much to say about apostasy, false prophets, and deceitful workers, who transform themselves into the apostles of Christ, AND concerning the people who will give heed to seducing spirits and follow the pernicious ways of those who deny the LORD that bought them and bring in the damnable heresy. The Holy Spirit thru the Apostle Paul says, “For this cause God shall send them strong delusion, that they should believe a lie: That they all might be damned who believed not the truth, but had pleasure in unrighteousness.” 2 Thessalonians 2:11-12. Note God’s warning against these unbelievers posing as Christians, “For many deceivers are entered into the world, who confess not that Jesus Christ is come in the flesh. THIS is a deceiver AND an antichrist. Look to yourselves that we lose not those things which we have wrought, but that we receive a full reward. Whosoever trangresseth, and abideth not in the doctrine of Christ, hath not God. He that abideth in the doctrine of Christ, he hath both the Father and the Son.” 2 John 7-9. Now, get this, most of these spiritual criminals (because criminal is what they are doing), are moral, religious, sincere religious infidels. Satan is accused of the crime of deceiving the whole world, but how any man can be so deluded by the arch enemy as to call himself a Christian while he denies the Genesis record of creation, the virgin birth and eternal Deity of the self‑existent Christ, then deny salvation from the sorrows of the second death by the Faith in His shed blood and bodily resurrection, and further go on to deny the other Christian doctrines of the Bible, is almost beyond comprehension or explanation! While there are many evangelical and evangelistic Postmillennialists, the majority of Christians are Premillennialists. BOTH groups believe in the complete and absolute inspiration of the Bible and therefore in the virgin birth and eternal Deity of the Lord Jesus Christ, and both believe that the Faith in the redemptive work of the LORD Jesus Christ will save sinners from the wrath of God, and that all who deny the Deity and virgin birth of Christ and do not accept by the Faith His vicarious expiation for sin are eternally and irrevocably lost. Most Premillennialists believe that between the moment members of the Body of Christ experience the blessed hope of Titus 2:13 and the day that Christ shall come to earth as the Son of man to redeem Israel, there will be on the earth that time of trouble called in the Bible “The Great Tribulation,” out of which Israel shall be saved. Then will follow the restitution of all things spoken by God’s prophets. Acts 3:21. We’ll discuss this much more later in this series of messages. “The only way to accurately identify a religious liberal or Modernist is to test their doctrine against the Word of God. This is the acid test. 1 John 4:1, "Beloved, believe not every spirit, but try (test) the spirits whether they are of God: because many false prophets are gone out into the world." MANY false prophets are gone out into the world. There are literally millions of false prophets today. 1 John 4:2 continues by stating, "Hereby know ye the Spirit of God: Every spirit that confesseth that Jesus Christ is come in the flesh is of God." Many people misunderstand this Scripture. It is not an all- inclusive test; but rather, a starting point. Think about it, every Roman Catholic believes that Jesus Christ came in the flesh; but then they worship Mary, teach a works salvation, require the seven sacraments to be saved, trust men (priests) to forgive their sins, and follow a host of other manmade traditions not found in the Word of God, The Bible. So when we test a person, we should START by asking them what they believe concerning The LORD Jesus Christ. There are many actual Christians are SO deceived by the liberals and modernists, (who are really unbelievers), that they quote and defend the jackals, supporting them in Christian schools, so that some truly born again Christians COMPROMISE until it is hard to tell the dirty child of God, from the wolf in sheep's clothing. For example, there is Dr. Nels F.S. Ferre, who says it is wrong to worship Jesus, and to follow the Bible. Well this heretic says that Jesus may have been the illegitimate son of a blond German soldier and Mary who was a harlot. But then get this...this man is advertised as "an evangelical," and has been welcomed at Southern Baptist Seminary and other "Christian" institutions, as was Dr. George Buttrick, who was the most outspoken opponent of the virgin birth, the blood atonement and inspiration of the Bible. There was also Dr. Elton Trueblood and many others who were actually unbelievers. Remember this, Christian, 1 Peter 1:18-19 says, "Forasmuch as ye know that ye were not redeemed with corruptible things, as silver and gold, from your vain conversation received by tradition from your fathers; But with the precious blood of Christ". There is no way a man can be saved and DENY the very precious blood of Christ that saves. These men are deceptive, and will say that the blood of Jesus is very important; but, the truth is that they believe Christ's blood is only REPRESENTATIVE of His death. These are the type of modernists which we need to avoid and expose. And THESE are the liberals and modernists that have taken over this nation’s seminaries. By the Word of God ONLY, members of the Body of Christ need to determine whether their denominational creed, Pastor, Preacher, or whoever and whatever, are truly of God. Again, the Word of God is the ONLY method by which to test these things. Therefore, in our next message of this series we will have for you some questions that you can ask. The Faith of Jesus Christ...VERY Important Message! 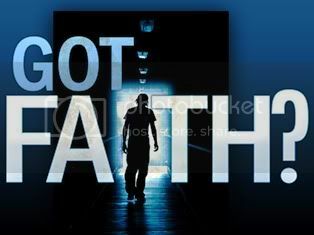 In other words, it is HIS Faith at work in us and in our hearts which produces righteousness and the God kind of life. And what is most important about this is the implications it has for us and our faith. First of all, it explains why The Faith is a GIFT and why we are saved through Faith by Grace and not as a work of our own. It is not our faith which justifies, but the Faith of Jesus given to us, which resides in us. Since it is not our faith that justifies, but the Faith of our Great God and Savior Jesus Christ, whose Faith is now at work on the inside of us, we are not called upon to believe God out of our own miserable resources or self generated faith or mental efforts, or our attempts to believe. We are only enabled to believe God through and because of the Faith of Jesus Christ as working in us. It is Jesus' Faith upon which we are dependent and upon whom we rely. It is upon His Faith, which is perfect and never fails, upon which we can rest and fully trust, because we know His Faith is sufficient for every need and greater than every obstacle.